For those of you who enjoyed Strange Tales , which were a bunch of short stories by indie comics creators about Marvel superheroes, it looks like a new set of stories will be coming out at some point. Farel Dalrymple broke the news on his LiveJournal page when he posted a couple of panels from his Spider-Man/Silver Surfer story. As with all of his stuff, it looks fantastic. No word on who else is contributing to the project, or when it will be released. Back on April 10th, I attended the MoCCA Fest panel called "Best Comics of the 00s." The panelists were Eric Reynolds from Fantagraphics, Becky Cloonan (Demo), Alex Robinson (Box Office Poison), Nick Bertozzi (The Salon), and comic critic Douglas Wolk. The panelists were asked to talk about their favorite books from the last decade. Here is a recap of the panel from moderator Brian Heater of The Daily Cross Hatch. 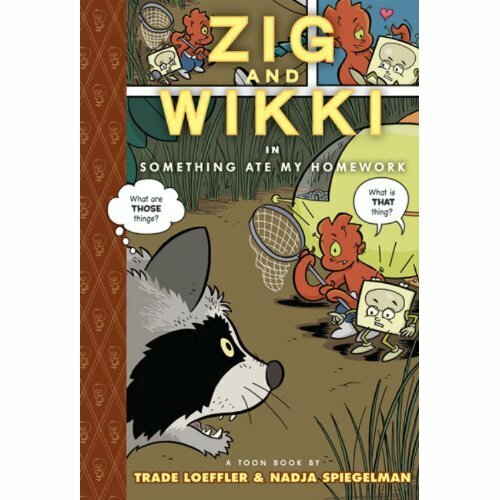 In Zig & Wikki, an alien and his talking encyclopedia/robot friend land on Earth looking to abscond with some local wildlife to fulfill the alien's homework assignment. They run across flies, dragonflies, frogs, and a raccoon, have a small adventure, and learn some science factoids courtesy of robot Wikki's encyclopedia screen. It's a cute and simple story, appropriate for all ages. 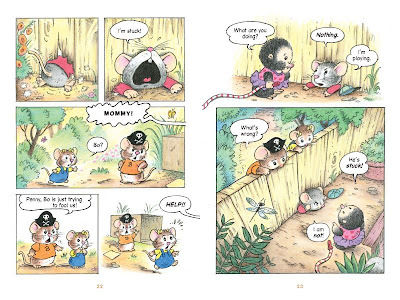 There isn't too much to say with this one: like all of the Toon Books, I can pretty much guarantee that small children will like it. READ MORE: Here is a six-page excerpt from the book. The brother and sister mice Benny and Penny have already starred in two previous books (Benny and Penny in Just Pretend and Benny and Penny in the Big No-No), so my kids were already familiar with them and looking forward to the new story. 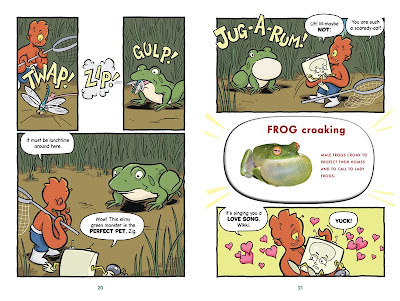 As with the earlier books, Benny and Penny face a problem while playing in their backyard. Here, their cousin Bo comes to play, and the three of them just don't play well together. Bo doesn't treat their toys well, and Benny and Penny don't want to include him in their playing. As with the other books, unfortunately, the kids are pretty mean to each other (every book uses the phrases "cry-baby" or "go crying to your mommy," which seems a little unnecessary -- even if it is clear that it is not a nice thing to say, I don't really want to introduce this phrase to my kids in the first place). But the ultimate message of the book is good: they learn that when they treat each other nicely, they all have more fun playing together. 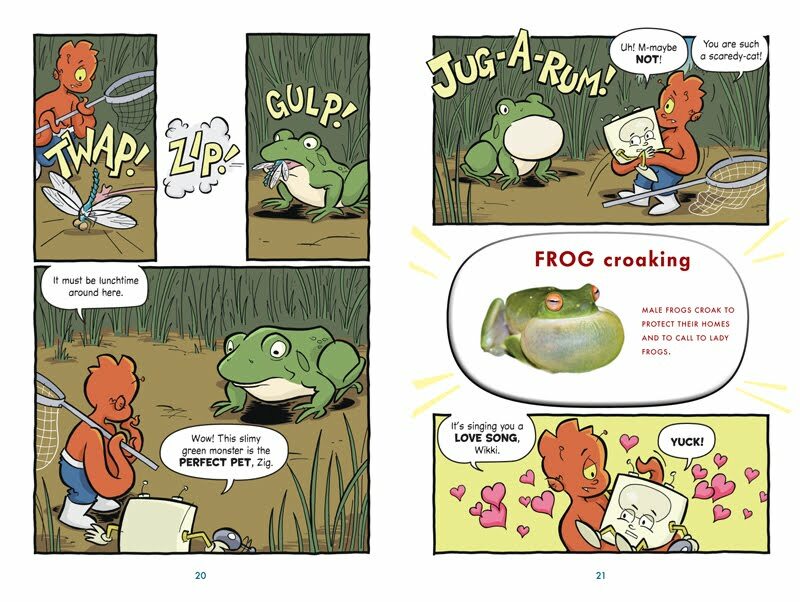 And I like Hayes's drawings -- they give enough detail to make the world interesting, but don't become overwhelming or too confusing for little kids. READ MORE: Here is a six-page excerpt. Disclaimer: These reviews are based on complimentary copies provided by the publisher.